I saw the zombie story and thought it was fun…considered doing something for III on it…glad you did! I’ve studied zombie survival for years now…the Zombie Survival Handbook is a great resource! Thanks Justin – it’s always good when a soc media campaign gets peoples’ attention. 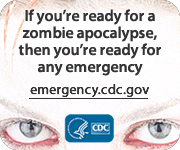 Great idea from the CDC.